We have had a house full of kids (our own three plus one of my daughter's housemates) since December 20. We had a wonderful Christmas together with some very special memories. I've also had a lot of meal preparation, washing dishes and laundry, and very little sewing time. This morning, though, I had to take my daughter to an early appointment and when we got home, she fell asleep on the couch. No one else was up, so I took a cup of coffee with me into the sewing room and spent some time straightening up and putting the threads from a finished project away while I listened to a podcast. When I emerged, my husband and one of my sons were on their way out the door for some "guy" time (our other son went back to New York yesterday). 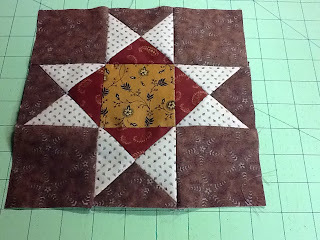 The girls were still asleep so I headed back down to the sewing room to start the block-of-the-month for my quilt guild. 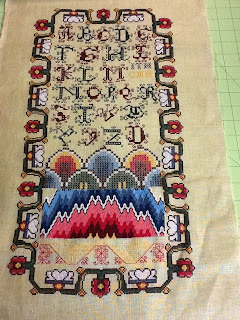 My Scarlet Letter sampler, Scottish Band, is finished! In my mind, it's a major accomplishment as I had to deal with a dye lot issue that caused me to frog the left half of the medium blue flame stitches as well as an issue with the chart. For the life of me, I couldn't get the placement of the flame stitches on the chart to look like the picture of the sampler. After I've lived with my finish for a week or two, I'm pretty pleased with the way it came out. And I've almost forgotten what a pain it is to do the backstitches around the letters.